Give the Gift of Relaxation with a Therapy Room NI eGift Card. In a bid to be more eco-friendly and cut down on waste we now only sell eGift cards rather than paper Gift Vouchers. Easier for you & kinder on the environment! 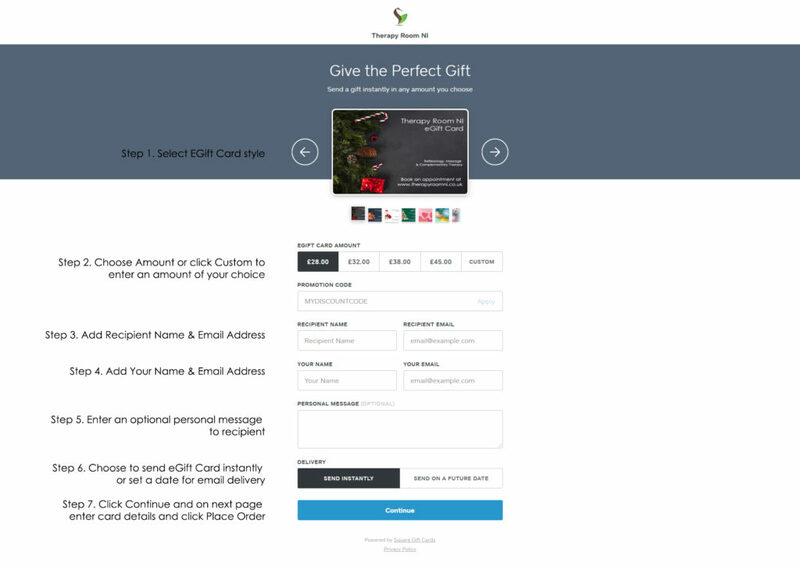 Simply choose the design of your eGift card, select the amount you wish to add to the card based on the treatments above, then add your recipients name, their email address & your own name & email address. You can also add an optional message and the eGift card will be emailed instantly or at a later date after you have completed payment by credit or debit card. View a simple 7 step Guide to buying an eGift Card below. Please make sure that you have read our Terms & Conditions relating to eGift Cards.